Arguably the most stunning and picturesque of England’s national parks, nowhere does the great outdoors and rural charm quite like the Lake District. 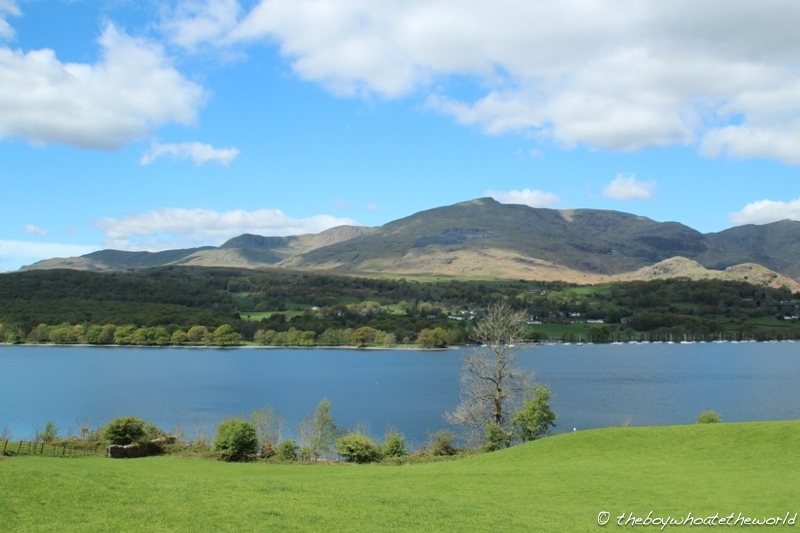 The gleaming expanse of The Lakes set against Cumbria’s steeply pitched fells and rolling forested valleys make for picture postcard scenery in every direction. But it’s not all hiking trails, grazing sheep and age-old inns here. The Lakes have seen a dramatic renaissance in the food and drink space of late. Michelin-starred restaurants and gastropubs are taking Cumbrian local produce to new heights. Farmer’s markets and artisan cheese-makers are just as much part of the scenery these days as the growing number of microbreweries popping up across the county. And nowhere is the gastronomy of The Lakes more celebrated than at Simon Rogan’s double Michelin-starred L’Enclume, located in a converted grey-stone blacksmith’s in the medieval village of Cartmel. Now, I must admit – I initially had my doubts about whether I would enjoy my meal at L’Enclume even before I gave the food a chance. Feedback from friends who’ve dined at L’Enclume, although generally very positive, pointed to more delicate flavours that my South-East Asian palate may not fully understand. Also, those of you who followed my journey on The Taste earlier this year may remember my disappointment (and Bourdain’s utter dismay) when Simon Rogan dismissed my Laksa dish in one of the immunity challenges as ‘too spicy’ (and this was after I had dialled back the spice level to a bare minimum….). Hence, a part of me was weary that my tastebuds would be rather disparate from that of Rogan’s and the team at L’Enclume. 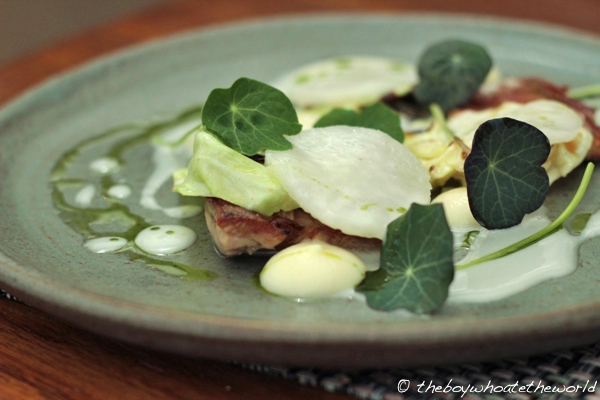 In truth though, our meal at L’Enclume was nothing short of exemplary from start to finish. Every single dish on their £45, 6-course lunch menu surprised, delighted and excited on every level. 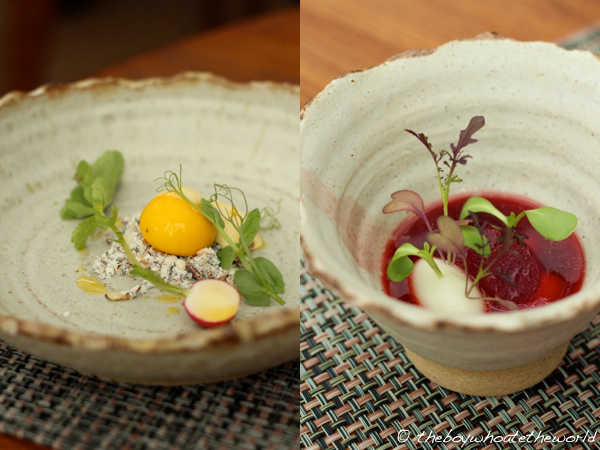 There are often no more than 4 key ingredients per dish, but the innovation and range of textures shown by Simon Rogan, Mark Birchall & team throughout was truly remarkable. At the same time, the food still manages to retain a simplicity and harmony in its flavours that go to the heart of L’Enclume’s philosophy of letting great produce speak for itself. One almost feels connected to where the food comes from source here. Our opening course, an egg yolk in disguise, was in fact a subtle saffron gel wrapped around a core of creamy, cod mousse. Crispy salt and vinegar flavoured puffs provided both texture as well as an uncanny resemblance to eating fish and chips! An ingenious yet comforting dish that was truly a joy to eat. The next starter also impressed. Whereas I often find dumplings overly stodgy, the signature Westcombe cheese dumpling here has an light, silky smooth consistency to it. A nourishing beetroot consommé, clarified to textbook precision paired off with the dumpling seamlessly. If there’s one dish from that lunchtime that truly left its mark on me, it was their stunning Venison tartare with charcoal oil. The deep, smoky flavour of the charcoal oil added a whole new dimension to the tender, melt-in-the-mouth nuggets of venison. Lightly pickled fennel rings, caper jam and a delicious mustard emulsion all came together to complement and cut through the gamey and smoky flavour of the meat. Easily the best dish I’ve had all year and it’s no wonder why it has become one of their staple signature dishes. Milk-fed kid (baby goat for those of you starting to get other ideas! 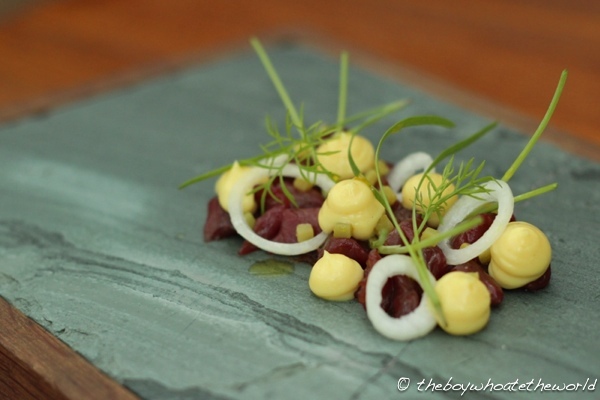 ), served with smoked turnips, parsley oil and nasturtium was a celebration of Spring time. The shoulder cut was slow-cooked to melt-in-the-mouth perfection whilst the belly cut was succulent with a crispy crackling. Speaking of crackling, the flavour of the meat was actually surprisingly subtle… much closer to that of suckling pig than lamb, no doubt due to the milk-feeding of the goat. An accomplished and harmonious dish on the whole that was made even better by the gorgeous presentation. The quality of the cooking continued through to the dessert courses. First up, a deliciously moreish beurre noisette ice cream, served with crispy rhubarb, rhubarb compote and apple puree. 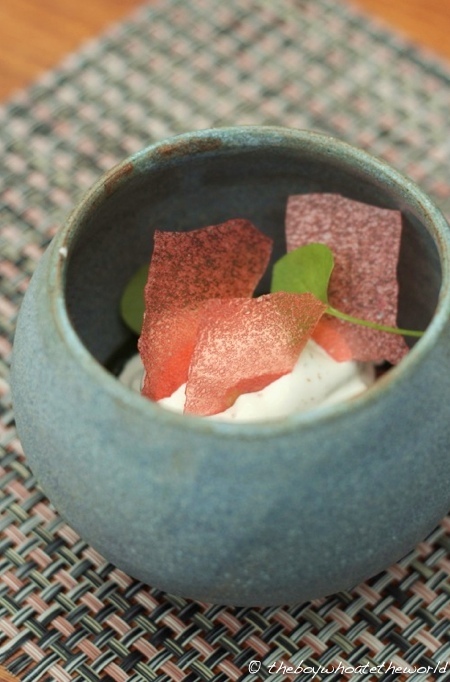 The tartness of the rhubarb and apple cut through the rich, buttery ice cream beautifully. 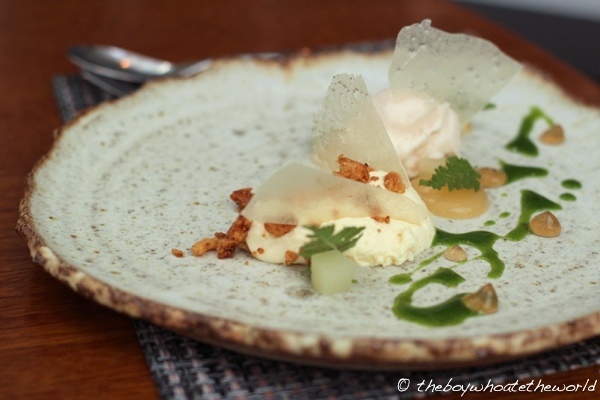 We finished with a creamy, air-light yoghurt, served with different textures of pear (fresh, crispy and sorbet’d). Crispy walnuts, walnut puree and sweet cicely herbs added a slightly earthy and aniseed note. Both were fresh, balanced and thoroughly enjoyable desserts on the whole. Service from their polished front of house team was genuinely friendly, enthusiastic and attentive throughout. They showed great knowledge of every single element which went into the dishes from the way the dumplings were cooked to the origins of their beautiful ceramic tableware. All in all, this is a kitchen brigade and front of house team at the very top of their game. A meal here is completely worth every mile of the 270 odd miles it takes to drive up to Cartmel from London. An absolute must on any Lake District itinerary – I’d happily return to feast upon their full tasting menu in a heartbeat.